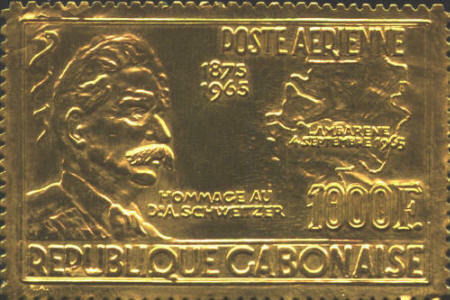 Dr. Albert Schweitzer, a medical missionary, theologian and musician was honored in 1965 by Gabon, previously French Equitorial Africa, with an airmail stamp. The stamp features a portrait of Dr. Schweiter and a map of Gabon with the town of Lambaréné, the location of Dr. Schweitzer's hospital identified. The stamp is embossed on gold foil weighing 0.6 gram.